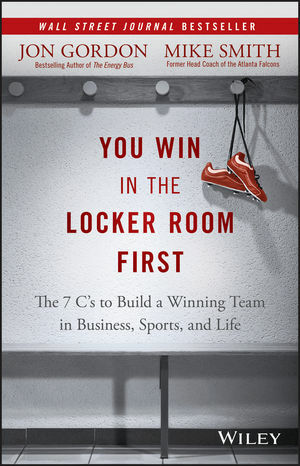 You Win in the Locker Room First offers a rare behind-the-scenes look at one of the most pressure packed leadership jobs on the planet and what leaders can learn from these experiences in order to build their own winning team. Jon Gordon is the author of numerous bestselling books and his inspirational talks have inspired audiences around the world. His principles have been put to the test by countless Fortune 500 companies, school districts, hospitals, sports teams, and nonprofits. Jon invites you to visit and connect with him at JonGordon.com or on Twitter @JonGordon11. Mike Smith is the former head coach for the National Football League's Atlanta Falcons, a position he held from 2008 to 2014. He is the all-time winningest coach in franchise history. In his first season as Falcons head coach, Smith was recipient of the NFL Coach of the Year Award by the Associated Press. He was also named NFL Coach of the Year 3 times by Pro Football Weekly (2008, 2010 and 2012).